Many people have, over the years, told me that I shouldn’t judge a book by its cover. But no one ever told me that I shouldn’t judge a sunset (or sunrise) by its beauty. 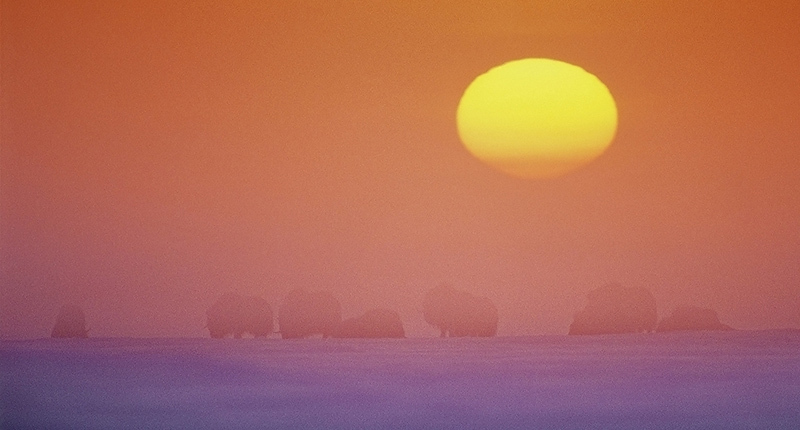 After all these years, a group of scientists finally pulled the curtain off of the golden lights of dawn and dusk. On March 25, the Atmospheric Chemistry and Physics journal published an article that addresses pollution in art. Soon I’ll talk about that, but first a bit about the Arctic. It was a cold November evening, in 2011. I was at a dinner gathering at the home of Peter and Helen Goddard. At the time, Peter Goddard was the director of the Institute for Advanced Study in Princeton. I was engaged in a conversation about—pollution in art—with art historians Christopher Wood of Yale University and Nicola Suthor of Freie Universität in Berlin. The question we were trying to figure out is this: Does a red sunset always mean that there is pollution in the air? The eminent theoretical physicist Peter Goddard stood there in silence, listening to our conversation. Perhaps he was curious about how a group of art folks would go about resolving a physics question. Even though I was “Once a physicist” and had an opinion on the subject, we art folks didn’t conclusively resolve the question that evening. At the time I was a director’s visitor at the Institute, working on the anthology, Arctic Voices: Resistance at the Tipping Point (Seven Stories Press, 2013). Here is an excerpt from my introduction in the anthology, “From Kolkata to Kaktovik” that directly relates to that November conversation. The question is: What is the long–term stress acidification from Arctic haze might put on the fragile Arctic ecology? While we don’t know this yet, the haze might also be contributing to the rapid polar melt. “Industry, transportation, and biomass burning in North America, Europe, and Asia are emitting trace gases and tiny airborne particles that are polluting the polar region, forming an ‘Arctic Haze’ every winter and spring. Scientists suspect these pollutants are speeding up the polar melt,” the Science Daily reported in 2008. Lindsey Konkel has written a wonderful article, “Old Masters’ Paintings Hide Clues to a Past Climate” in Climate Central’s The Daily Climate, to bring attention to the study by the German and Greek scholars. Her lucid prose makes their academic paper more accessible for the larger public. The red, and other warm colors, during dawn and dusk, arise from scattering of light from particulates, called aerosols, in the atmosphere. Aerosols can come from varieties of natural and anthropogenic sources, including volcanic eruptions, forest fires, dust storms, agricultural burning, natural gas flares, soot from vehicles and coal-fired power plants, and burning of trash. “Paintings may provide reliable estimates on aerosols in the atmosphere at times before instrumental measurements,” Christos Zerefos, the lead author of the study and professor of atmospheric physics at the Academy of Athens in Greece, wrote in an email to Konkel. This is an important affirmation that art can provide valuable information for scientific analysis. Scientists have been using plant stomata as a proxy to build a picture of the paleoclimate that goes back tens of millions of years. In a similar way, by using historic paintings as a proxy, the scholars in Europe maybe building a picture of, not only aerosols in the atmosphere during volcanic eruptions, but also a portrait (of pollution) of the industrial human. The red and orange colors in paintings, such as Joseph Mallord William Turner’s Red Sky and Crescent Moon, circa 1818, and Casper David Friedrich’s Woman before the Rising Sun (Woman before the Setting Sun), circa 1818, can likely be linked to the 1815 eruption of Indonesia’s Tambora volcano. “That eruption scattered particles high into the atmosphere that produced bright red and orange sunsets throughout Europe for three years,” Konkel writes. These paintings provided a clue to past atmospheric pollution due to volcanic eruptions. 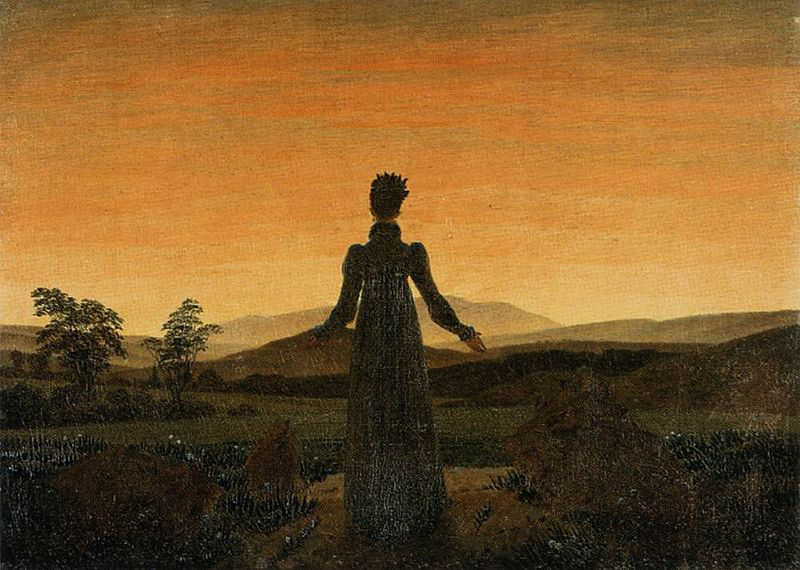 Casper David Friedrich’ Woman before the Rising Sun (Woman before the Setting Sun), circa 1818 (source: Wikimedia Commons). In the muskoxen photo, I too had inadvertently captured the increase in pollution, in the far North. Aerosols, natural (volcanic eruption) and anthropogenic (Atmospheric Brown Cloud over Asia), are known to cool the earth temporarily, by reflecting back part of the incoming solar radiation. The anthropogenic aerosols that contain black carbon (Arctic Haze and the Atmospheric Brown Cloud), however, can have significant warming effect. Irrespective of its impact on the climate, anthropogenic aerosols from coal-fired power plants, natural gas flaring, and other industrial sources have very significant health impacts. “In India alone, about two million people die each year from conditions associated with atmospheric pollution,” according to a 2002 UNEP report, Asian Brown Cloud: Climate and Other Environmental Impacts. 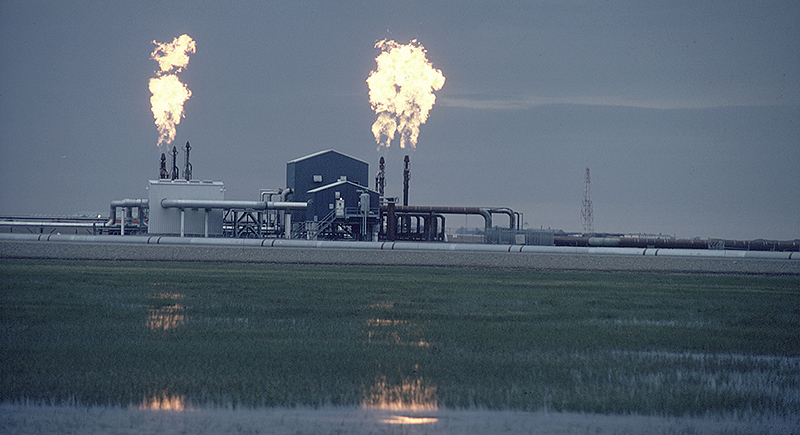 Gas flaring at Gathering Center 1 production facility at Prudhoe Bay. Photograph by Pamela A. Miller, 1988. The UN Intergovernmental Panel on Climate Change has just released the “Climate Change 2014: Impacts, Adaptation, and Vulnerability | Summary for Policy Makers” report. I don’t want to overstate the significance of art in addressing the Himalaya of environmental injuries that surround us today. I do want to point out, however, that while scientists have been telling us about earth’s climate in the deep past, and into the distant future, artists on the other hand, have been bearing witness, in the present. They always have. This article and the accompanying muskoxen photograph may be reproduced free of charge by any person or publication, without permission from ClimateStoryTellers or the author.